It was a deserving day of cricket. But only Bangladesh deserved to win the finals. Even before players could wake up. Everybody in the world was sure that Bangladesh will win the Asia Cup, because, well, they deserved it, making the whole point of playing the game an utter waste of time. But ah well, some ICC Rule number 137897.124.124.124.623.5.32.5.2 section a. said that it deserves to be played. So, Bangladesh wins the toss and they opt to bowl. They deserve to. Hafeez and Jamshed walk out to open, and Athar Ali Khan already has uttered “My Word” 47 times. That’s alright. He deserves to do that. Mashrafe Mortaza will open the bowling for Bangladesh. Wonderful bowler. Destroys India, does nothing more than that. Has more injuries than wickets. And Bangladeshi crowd goes berserk when he gets dropped for non-performance or even injury. That candidate always deserves a spot in the team. So, here he comes, bustling like a train, and it’s a wide to start the innings. Wide down the leg side, and Mushfiq had to jump like a toad to pouch that one. But don’t worry, the umpire doesn’t signal a wide. Mashrafe has been through a lot. He deserves a good first ball. A few overs go by, in which the other fast bowler, whose name I don’t remember now, and as I deserve for that, I get flak for forgetting, gets two wickets. One because the umpire gave an lbw when the ball seemed away and comfortably went to the keeper’s hands. But, well, that ball deserved an LBW to its credit. And the other wicket was because Hafeez thought the bowler should deserve another wicket for being a fast bowler on the Bangladeshi cricket team. So, he shoulders arms and lets the ball come and hit his stumps. Bangladeshi Polka Dots dressed fans are ecstatic. Hafeez tells them that they deserve to be happy, just like Sacramento Kings’ fans must be. Also, Mr My Word and Mr Safety are replaced by Mr Running The First One Hard (imagine saying hard in #huan tone) and Mr Just 65 Runs To Go For The Century. Pakistan are 143/3 after 32 overs. They now decide that the Bangladeshi bowlers deserve to have done better. so, Pakistan’s score is revised to 123/4. Shakib is a wonderful bowler. My word. Also, Mahudullah, Suhrawadi Shuvo, Abdur Razzak and the other 17 spinners in the side. So, they all deserve to see a better score on that big screen. Pakistan will not get their batting powerplay. Come on… Why should they? They don’t deserve to hit more runs. And Afridi deserves to be out. So, the bowler bowls the ball, keeper collects it, returns it to the bowler and the bowler dismantles the bails. And appeals. All batsmen are inside their respective creases. But, Bangladesh deserve to get rid of Afridi early. So, Afridi is out. Striker standing inside the batting crease is run out at the non-striker end. Bangladesh deserve to make history. Shakib al Hasan finishes with figures of 10-1-42-2. Wonderful bowling. He deserves some more overs. So, he gets to bowl 4 more overs. Gets 2 more wickets at the expense of just 8 runs. My Word. Pakistan end their innings at 254/8, after some rocking and rolling smashing hits from Misbah and Umar Gul. Fans did not expect this, so they weren’t sure if they deserved it or not. So, they were granted the permission to score freely. Tournament organizers decide that Bangladesh deserve another win in the tournament. So, they toggle the result of the tournament opener and award Bangladesh with the win over Pakistan in the opener. The organizer said “Nasir Jamshed did not deserve to play that kind of innings.” So, Bangladesh have topped the league table. There is no rain, but the D/L method score will be applied on the Pakistani Score. D/L – Deserve to Lose. So, the target for Bangladesh is not a paltry 132 runs in the whole 50 overs. Umar Gul will open the attack. And sends in a toe crushing yorker at Tamim Iqbal, who totally misses the ball trying to play it across the line, and the middle and leg stump for the same angle that Afridi forms with his arms while celebrating a wicket. The umpire then goes to Gul and says, “Hey, Tamim deserves a second change.” And, Tamim can stay. But Gul manages to remove Tamim Iqbal three more times in the same over, and Tamim had to leave. Even some Bangladeshi fans were irritated and said that Tamim doesn’t deserve another chance. Pakistan have made a breakthrough. They had to go back and close the flood gates thrice in the same over, but they can finally leave it open. Afridi comes in to bowl along with Ajmal. Afridi has been removed off the attack because of moral policing. People complained that he is only 18 years of age and has been faking an increase in age for the last 13 years. So, he doesn’t deserve to bowl. And yes, as is the general opinion amongst everybody, Ajmal doesn’t deserve to bowl at all. So, Pakistan are reduced to bowling out the overs with Gul, Hafeez, Cheema, Younis Khan and Hammad Azam. In spite of Bangladesh losing wickets now and then, they get some runs on the board through Shakib al Hasan’s bat. He deserves to be the number one all-rounder in the whole universe. Martians deserve to immortalize Shakib by planting a statue of his when they visit Saturn next. It all comes down to the last over. Cheema has to bowl to Shakib and Shahadat Hossain. Bangladesh need 9 off the last over, only 2 wickets remain. How it came this close is anybody’s guess. You deserve to make a guess, you have a beautiful mind. It’s alright if you didn’t make it to IIT and then into IIM and earned $$$$$$$$$$$ in business. But you deserve to make a guess. And Yes. Bangladesh have won the Asia Cup. Congratulations, Bangladesh. Shakib deserved and got the Man Of The Final Over, Man Of The Match, (and while Shakib goes to collect his man Of The Series Award, LSK exclaims “He is running the first one haaaard”), Man Of The Series, and also in advance, the man Of The World Cup and The Best All Rounder Award for the years 2012 to 2018. Also, congratulations Sri Lanka on winning last year’s World Cup. You deserved it. We were just trolling you by winning it for ourselves. We are selfish like that – winning World Cups and all. An undercooked Team India, which was coming out of a long lay-off and with a few star players (Virender Sehwag, Gautam Gambhir and Zaheer Khan) injured, won the Compaq Cup in Sri Lanka after beating the hosts in a close game in the Finals. India’s win came on the back of Sachin Tendulkar’s 44th ODI Ton and owed thanks to Harbhajan Singh’s 3rd 5-wicket haul! For the first time, in my view, India got her batting order right. Dinesh Karthik, who killed off his Test career on India’s last tour of Sri Lanka, probably did much the same to his ODI career in the first two games that he played in the Compaq Cup. I reiterate that I have nothing against the lad. He is a good player and more power to him. However, when it comes to crunch situations, he repeatedly fails to deliver. Prior to the start of the series, I had predicted that he would carry drinks for India. Thanks to Gautam Gambhir’s injury and Team India’s muddled thinking, Karthik was asked to open in the first two ODIs. He failed in both. Further, his batting meant that Sachin Tendulkar had to change his style of play. 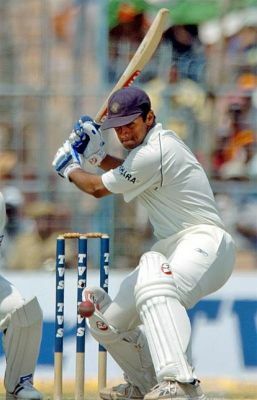 In yesterdays’ game, Tendulkar opened with Rahul Dravid, whose stability allowed Tendulkar to play the way he normally does — really well and freely. The other change that I have yelled for was for captain M. S. Dhoni to walk in at the fall of the first wicket. In yesterdays’ game, he did so and the change was remarkable. He brought a calm solidity to the batting. Although he fell just when things were starting to get interesting (when the batting PowerPlay was taken), he had built a solid foundation to India’s innings by the time he left. In the end, thanks to that foundation, although I thought India floundered a bit between overs 40-45, the score was respectable and good. That Sri Lanka gave that total a real shake is a credit to their emergence as a strong ODI team these days. I do like the look of the Sri Lanka team. The team has some excellent bowlers and with the rapid strides made of late by Samaraweera, Kandamby and Dilshan — not to mention his now famous DilScoop — the batting looks strong too, especially when you consider the experience provided by Sanath Jayasuriya, Kumar Sangakkara and Mahela Jayawardane. In the end, India emerged winners. The margin of victory (46 runs) might seem comfortable. However, India did have some scares, not to mention poor fielding and dropped catches. India needs to do more work in these departments before it can think of laying a fingerprint on the Champions Trophy. However, it was nice to see Harbhajan Singh get a 5-fer with good bowling and not the spear-em-in sort that he normally resorts to in ODIs. This bodes well for India in the season ahead. And so, after a long break from cricket (and i3j3cricket.com) in which there were a few sporadic games (and posts), we are back into a busy period of cricket (and posts) for India (and i3j3)! The season commences with the Compaq Cup in Sri Lanka between New Zealand, Sri Lanka and India. The first game of the 4-match series resulted in a Samaraweera-inspired win for Sri Lanka over New Zealand. The India Team is in Sri Lanka and is eyeing the #1 ODI spot, which India will make if it manages to win all 3 games in the Compaq Cup. The Corporate Cup in India will have helped dust the cobwebs in the minds and bodies of the players. A few of the players did get to match fitness with some important scores. Suresh Raina made some runs and so did M. S. Dhoni and Rahul Dravid. R. P. Singh and Ishant Sharma bowled well in patches. So with all of that done and dusted, the real action commences. Unfortunately for the Team India fan, the next few months is going to be a sequence of ODIs! The team is a good one, in my view. The batting is good and strong. One might have mounted an argument for Rohit Sharma. But in all fairness Rohit, like Uthappa, does need to do some work on his own. It isn’t quite about ability or talent. It is really about rising to the big occasion. Perhaps it is more a question mental toughness than anything else. The batting has a settled and set feel to it and offers tremendous flexibility as well as depth. The openers may as well pad up now! There is no questioning who will open the innings! There are a few questions though: (a) will both all-rounders play? (b) will Rahul Dravid play? (c) will Suresh Raina play? (d) what will Dhoni’s batting position be? I am certainly glad to see Abhishek Nayar and Yusuf Pathan there in the team. In my view, both of these must play and so must Rahul Dravid. And in what must be a somewhat radical suggestion, I recommend that Suresh Raina competes with Rahul Dravid for a spot and both of them bat way low in the batting order, behind the big hitters and even the all rounders. Dravid has the finishing ability and so does Raina. In my view, Raina’s talent is wasted at #3 and it would be best if Dhoni occupies that spot. Dhoni’s big hitting talent is wasted at #5 or #6. In terms of bowling, I feel that both Praveen Kumar and Ishant Sharma are automatic picks and in all probability they will open the bowling. Ashish Nehra and R. P. Singh might compete for the 3rd pace bowlers spot. With Amit Mishra unlikely to shake off Harbhajan Singh’s hold on the spinners’ slot, the 4th main bowler’s spot is also taken. There are plenty of options for the 5th bowler’s spot with Yusuf Pathan, Abhishek Nayar, Sachin Tendulkar, Yuvraj Singh and Suresh Raina (if he plays) vying for an over or two! The team also has competition in the drinks waiter department! Karthik is my first choice followed by Amit Mishra! Is this team capable of taking the #1 spot by winning all 3 games? Possibly. But, given the lack of match practice, I won’t be holding my breath. In my view, it is all a bit of fun and games! So, let the season begin and here’s looking forward to more posts on i3j3cricket!